Today marks the 82nd anniversary of the end of the disastrous "noble experiment" called Prohibition. The 18th Amendment of the US Constitution was ratified on January 16, 1919 and went into effect one year and a day later. Enforced by the Volstead Act of 1919, Prohibition outlawed the sale of beer and intoxicating liquors within the US. Though it succeeded at dramatically reducing the consumption of alcohol, Prohibition resulted in a dramatic increase in criminal activity and made criminals out of everyday citizens. 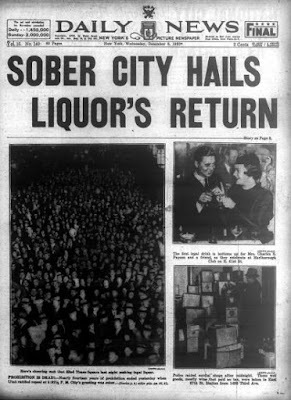 You can read the news article from the Daily News, printed December 6th, 1933, concerning the end of Prohibition here.